СКИ СКОК. Владимир Зографски се класира шести в състезанието от Световната купа по ски скокове във финландския зимен център Рука. Българинът записа рекордно класиране в елитна на ски скоковете, като постигна резултат от 133.4 точки. Зографски скочи 140 метра при вятър от 1.55 м/с. Състезанието в Рука, което е втори кръг от Световната купа, спечели Риу Кобаяши със 142 точки. Той победи полякът и носител на Световната купа за миналия сезон Камил Стох (139.9) и друг поляк Пьотър Жила (135 т.). Пред Зографски се класираха още Домен Превц от Словения и германецът Карл Гайгер. Това е трето влизане на Зографски в топ 10 в Световната купа. През 2011 г. той беше осми в Лилехамер, а година по-късно се класира десети в швейцарския център Енгелберг. В първия старт за сезона Зографски се класира 47-и. През 2018 г. българският скачач постигна най-добрия си резултат от близо пет години, когато завърши 21-и в Трьондхайм. Зографски направи силен сезон, преодолявайки 12 пъти квалификациите. На олимпийските игри в Пьонгчанг той пренаписа историята на българските ски скокове с 14-а позиция на малката шанца. 24 ноември 2018 г., 20:03 ч. 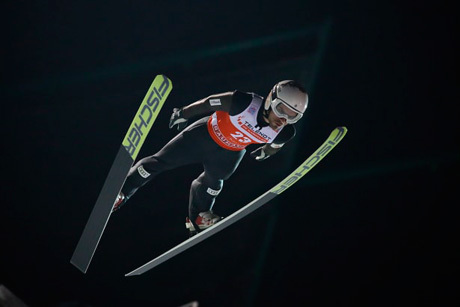 22-year-old Ryoyu Kobayashi of Japan won the first of two Ski Jumping competitions in Ruka (FIN). After a long day with various delays and long waiting periods, Kobayashi took the win ahead of the two Poles Kamil Stoch and Piotr Zyla. This was the first win in the World Cup for the younger Kobayashi brother, who now also leads the overall World Cup with 160 points. "This was a really long day today. I am happy with my performance today and I hope I can achieve another strong result tomorrow", Kobayashi explained after his first win. 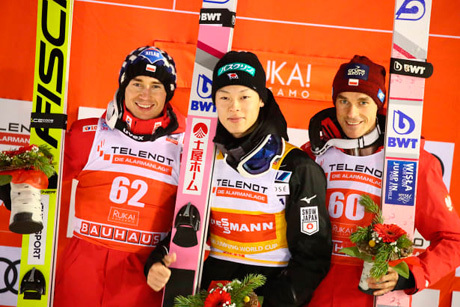 Kamil Stoch and Piotr Zyla provided yet another strong result for the Polish team with the second and third place. "Congrats to Ryoyu, he's in a really good shape right now. It was a tough and long day because we had the training round in the morning and then we had to wait the whole day for the next jump. I'm glad that I could remain focused from the morning to the afternoon. The result was positive and I'm really satisfied with my jump. Tomorrow I hope that we have good weather conditions, fair for everyone", said Kamil Stoch. The longest jump of the day was shown by Slovenia's Domen Prevc, who started already with bib number 21. Prevc, who won in Ruka 2016, jumped on 146 m and came in on a very good fourth place. Besides Prevc, Timi Zajc (7th) and Anze Lanisek (10th) also finished in the Top 10. It was a strong team result for the young team of head coach Gorazd Bertoncelj. And it was also a good day for the German team. Karl Geiger (5th), Andreas Wellinger (9th), Markus Eisenbichler (15th), Stephan Leyhe (16th) and Richard Freitag (21st) were showing strong performances and are always capable of achieving a podium result. Severin Freund, who made his comeback today, was 29th and also left a good impression. 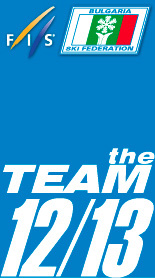 The German team seems to be stronger than ever. It's still not going as well as expected for the Norwegians. Robert Johansson was their best in eighth today. And also the Austrians can't be satisfied with their results so far. Best of the Austrian team today was Gregor Schlierenzauer in 12th. "Ruka is a great facility, a really cool hill. But we know that you also need some luck with the wind. It's a pity that we had only one round. I'm satisfied with my jump, it was solid. I can build on that and now I'm looking forward to tomorrow", Schlierenzauer said after the competition. A great performance today was shown by Bulgaria's Vladimir Zografski. He was jumping early with bib number 23, seized this opportunity and finished on a career-best sixth place. The training and the qualification for today's competition had to be postponed various times due to wind speeds of up to 11 m/s. Then the qualification was canceled and it was decided that the competition with all 65 athletes will be decided after only one round. And this strategy of the jury paid off. The decision to start at 6:50 pm LOC was absolutely right and the competition was carried out without breaks or delays. Ryoyu Kobayashi now leads the overall World Cup with 160 points, followed by Kamil Stoch (130 points) and Russia's Evgeniy Klimov (100 points). The team of Poland is ahead in the Nations Cup with 707 points, Germany (645 points) and Japan (439 points) are second and third. 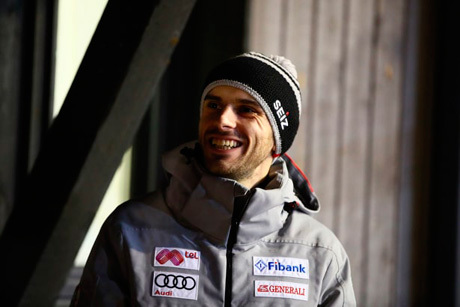 The second competition in Ruka starts on Sunday at 5 pm CET (6 pm LOC).